My Saab 9-3, BU51CDN, when new to me in 2004. A long and happy relationship has come to an end. After thirty years, I no longer drive a Saab. I don’t normally indulge in petrolheadism, but this is something of a sea-change for me. That idiosyncratic Swedish marque has been a part of my life for a very long time, and that needs to be marked. I first bought a Saab in 1983. Up until then, I’d had two cars – a battered old Triumph Herald (in which I once burnt off an MGB, much to both our surprise) and a Hillman Hunter (of which the best thing I could say is ‘meh’). I had regularly walked past a Saab 99 parked on the side of the road near my house with a ‘for sale’ notice in its window; like others, I’d looked at its mileage and thought “this car looks too good for those miles to be true”. But after seeing the car close up for a number of weeks, I came to the conclusion that it probably was true. Eventually, I spoke with the vendor – himself a dyed-in-the-wool Saabist – and found that it really was as good as it looked. I ran that car, a red two-door Saab 99L, FRA215L, for four or five years; and when I discarded it, I handed it on to my father, who ran it for a number of years more. It was eventually sold on to the daughter of a family friend and went to Merseyside. My next Saab was a red four-door 99, WEO409T. I followed it with a 99 five-door, which I bought from a man who had been the Coventry Radio Rentals tv repairman, and who had spent a lot of money on it because he got expenses for using his own car. It was a pale off-white colour, and it was so big that some of my friends took one look at it and dubbed it ‘the Magnolia Monster’. You could certainly get full-length wardrobes in it if you both dropped the rear seat and folded the front passenger seat down as far as it would go. In the meantime, my father bought a dark blue classic 900. I was never over-keen on that; the front end seemed very light to me. When that expired, he had a red two-door 99 for a short time. 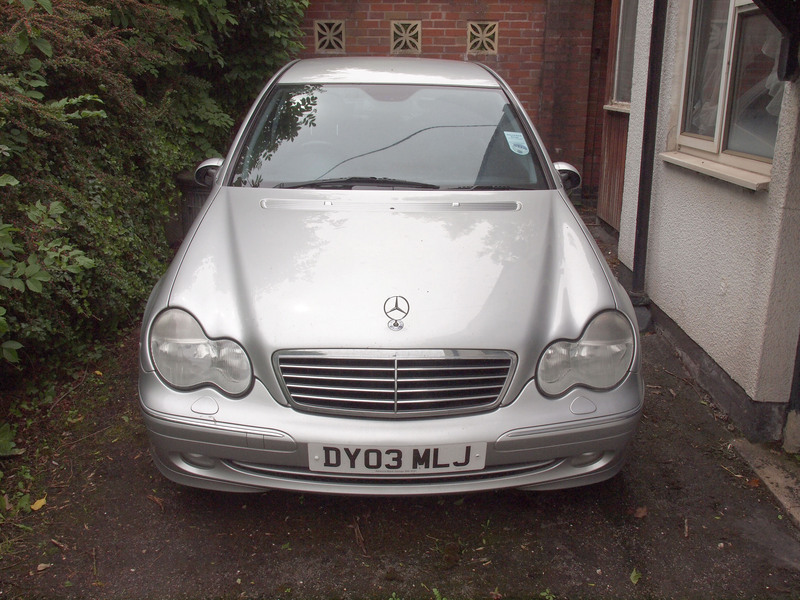 It had been messed around with by a number of owners, and it had an untraceable electrical fault. That didn’t last long, as it was written off after a vehicle collided with it whilst parked and managed to shift it 18 inches to the right – quite some impact. 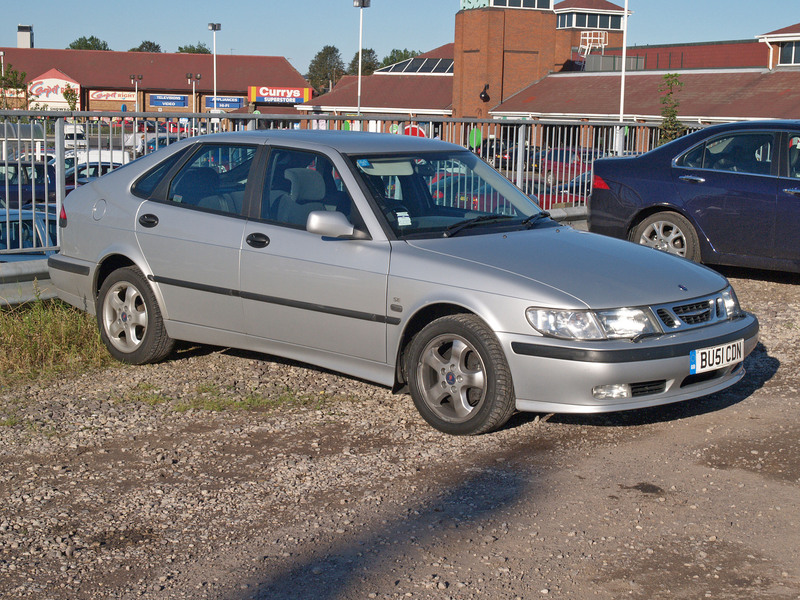 My next Saab was a bit of a rarity: a 90, C423VEA. This was the tail-end of classic 99/900 production; it was a 99 up to the B pillar and a two-door 900 behind it. In particular, it was a hard-to-describe red/brown colour (‘Rodonite’), had been polished so much that in sunny weather the roof turned blue with the reflection of the sky, and it had a massive boot. I kept it for quite a few years until it began to show signs of needing a new head gasket; that coincided with my coming into some money and as it was quite high mileage – approaching 150,000 – I decided to change it. I took on one of the first production batches of what fans call the “GM” 900. This was a nice car, but it suffered from the sort of teething problems that any new model might have. The heater always produced a trickle of warm air under all conditions; the door drains blocked easily and led to some corrosion appearing quite early; it had a cable-operated clutch making it ridiculously easy to stall; but worst of all, the reverse pinion in the gearbox failed early, making it more and more difficult to engage reverse gear – a particular problem for the Saab, with its anti-theft lock tied into the gear lever, so you could only get the ignition key out if you put the car in reverse, and only get the car out of reverse when the key was in position…. I was facing a massive bill for a gearbox rebuild, when Saab, by then fully in the hands of General Motors, bought out the 9-3 Sport, which turned out to be the last Saab model. They sent out an instruction to all dealers that they should clear their showrooms of all second-hand cars with old body shapes, and so I had a card drop through the door from my main dealership, offering £2000 minimum part exchange on all cars, irrespective of condition. This was too good an offer to refuse, and so I joined the general stampede of buyers to my dealer and came away with a silver 9-3 (still the “GM 900” body shape), BU51CDN. This was without doubt the newest (four years old), most powerful (with the low-pressure turbo, it delivered 150 bhp – hardly muscle car stuff, but quite capable of burning off boy racers at the lights, who thought it was just another boring silver repmobile, especially as Saab didn’t overdo the badging) and up to now, the best car I’d ever owned. So why did I dispose of it? After all, when my father was still with us and taking my hand-downs, we were known in the area as “the house with two Saabs” by anyone asking directions. Well, to begin with, it has to be said that the build quality under GM declined over time. Last year, for example, I experienced a Saab first for me – the car needed welding to get through its MoT. Saabs never needed welding, in my experience! But this one was suddenly suffering severe perforation of the floorpan on the passenger side. It’s a sobering thing when the garage owner puts the car up on the ramp, then invites you underneath to show you how he can pull carpet out through the holes in the floor…. That took nearly £400 to put right, and there was the prospect that the driver side would need welding this year. And then there were signs of more corrosion in the wheel arches. There were a range of suspension problems; the engine temperature sensors all failed, which meant that the cooling system was working under the impression that there was a Saharan heatwave going on, and the engine was running so cold that at times the temperature gauge dropped to zero and stayed there on a one hour journey. Then there was the dealer network. In more recent years, I used to go to Lime Garages of Leamington Spa, an excellent Saab main dealer and run by enthusiasts (they had a pristine 96 in the showroom as a display car, and one of their classic 900 hacks was actually the factory demonstrator from when the model was new; it had been tested on Top Gear back when that show wasn’t a tv lads’ mag and even the mechanics nicknamed it ‘Bessie’). For a main dealer, their prices were no worse than I was getting charged by some outside garages, with the added advantage that they did the job on time (in one case, in one day compared with the fortnight a local garage took for the same work on the braking system), they did it with a smile, and above all they did it right. I only ever had to take one repair back to them for rectification in some ten years, and when I turned up and said “It’s gone wrong”, their reaction was “Take Mr. X’s car off the ramp and see to Mr. Day’s immediately”. But then they got taken over by a dealership chain from South Wales, who spent a lot of money on the showroom, but then the lease expired and they declined to renew. Instead, they merged the dealership with one in nearby Coventry, and many of the Leamington staff transferred there. They lasted about a year. Then, as Saab began to experience difficulties, the dealership was suddenly rebranded as a Hyundai one, and Saabs were definitely relegated to the back lot. Then I had a drive belt go, and their replacement lasted about ten days. When I limped in with a badly frayed replacement which was threatening to break at any moment, their first opinion was that there must be some underlying problem with the car – but they couldn’t find one, and so grudgingly replaced the drive belt under warranty. About 18 months later, I needed a new clutch fitting, and they did it – at a price – but when I took the car home, I found gear changes not smooth and the reversing light did not come on. I took it back the next morning and they were very equivocal about looking at it there and then. I had to get a bit stern on them to emphasise that I was bringing the car back under warranty, and they were a bit put out that I made it clear that I would wait until it was done. Two bad repairs in less than as many years and an attitude problem to boot is not a good sign in my book. And then there was the brand itself. General Motors bought into Saab in the 1980s, and eventually acquired a controlling interest in 2000. At the time, major manufacturers were buying or creating prestige marques – Ford bought Jaguar and Volvo, Toyota had Lexus and Nissan created Infiniti, so GM obviously thought they should do the same. But having bought it, they showed no sign of knowing what to do with it. Saab went from being officially one of the top Cool Brands in the early 2000s to being thought of as being badge-engineered Vauxhalls (Opels to European readers); they weren’t, but GM did nothing to dispel the myth. Advertising diminished, and the 9-3 Sport didn’t have enough commonality with other GM models – in other words, wasn’t badge-engineered enough! – to make money for GM. The comment from the factory was that GM seniors never put in an appearance, and the workforce felt they had little trust in their distant management. Then GM let the firm go bust, but were extremely sniffy about the amount of technology transfer they’d permit any buyer – even after the owner of Spyker, who took it over but went bust himself, tried to sell to the Chinese. But back to my motor. The guy who I took the car to for repair last year said that he’d give it a year before it needed so much welding that it’d be uneconomic to repair. With all the foregoing, I have to say that the writing was definitely on the wall. So when a four-week contract doing software testing for a specialist biomedical software firm came along, I thought I’d be able to assemble a few hundred pounds to keep myself on the road with some banger or other. That was fourteen weeks ago, and I’m still there. My war chest had grown from a few hundred to a couple of thousand, and with that I was able to go to a dealer who had been recommended to me as a reasonable person to do business with, who could find me something that would suit. My criteria were for something Scandinavian or central European, within my price range, and (if possible) a five-door or estate. 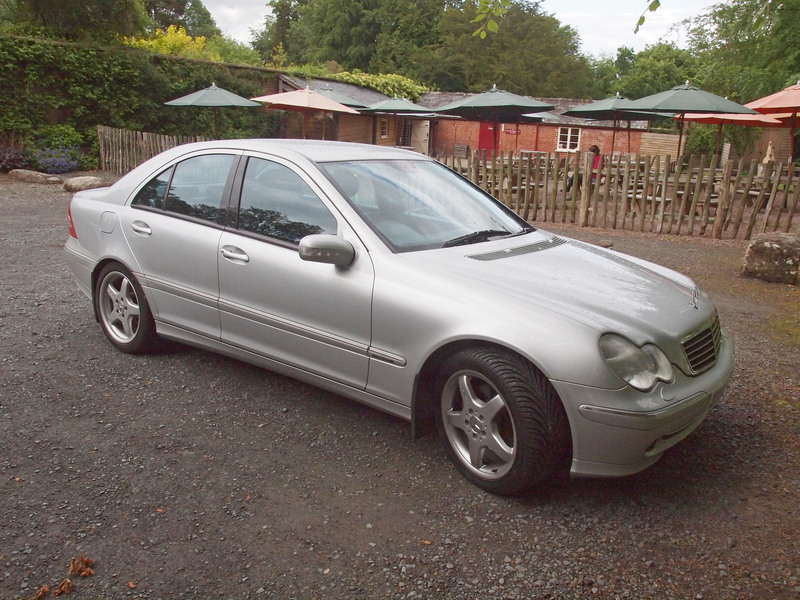 As it happened, he had something that ticked two out of the three boxes available right there – a Mercedes C270, with good provenance (the same guy had maintained it for the past five years) and a comparatively low mileage for a ten-year-old car (93k, as opposed to my thirteen-year-old Saab with 163k on it). The car looked well for its age, didn’t make much in the way of unpleasant noises, and whilst it didn’t have five doors, it was possibly the best I was going to get for the money with a reasonable chance of it being sound. So I’ve been running it now for about a week, and I have to say that I’m pleased. Although it’s an automatic diesel, the days of automatics being gas-guzzlers have gone. This is retuning me up to 46 mpg – far better than the Saab’s 37 mpg at best – and if I’m careful where I buy my fuel, I can see this being fairly economic. The car has all the toys, and most of them work; and I’m quickly getting used to the automatic transmission. One big difference I notice is that the vehicle seems much more sophisticated than the Saab; but my 9-3 was at the end of its model development, whereas this C270 was a fairly new model when it rolled off the line in Stuttgart. Cathy commented that although the Saab was built in the 21st century, it was a Twentieth Century design, whereas the Mercedes is a completely 21st-Century vehicle. And yes, it fits on the drive! And here’s an odd thing. I drove Saabs for 30 years, as I said, and I loved them. They were individualistic, they were different, they were a bit unusual. For a while, they were rather cool. They appealed to my sense of understated rebellion; being different, but doing it in ways that take people by surprise has always been my Way, and the Saab (especially this last one) was an ideal car for that. But I have to say, I feel different driving the Mercedes. I feel as though I have Arrived, which is a rather odd feeling for me; yet it also feels rather good. (Mind you, driving around Cathy’s part of Erdington, a few heads turned in ways that made me feel a bit like some sort of drug dealer…) Perhaps I should get a bit more used to this blowing one’s own trumpet a bit….